Presentations with Full HD Detail. 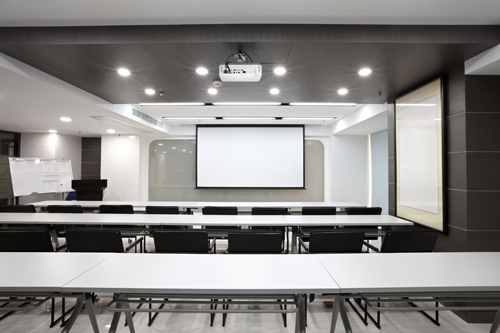 Designed for permanent installation in conference room, university classrooms or small auditoriums, the P502HL delivers native1080p resolution, eye-catching color, and enough brightness for large screens in moderate ambient light. .
24/7 High Resolution Displays and Signage. Low maintenance 24/7 operation, thanks to a 20,000-hour laser light source. Extraordinarily flexible setup: Can flip the image to portrait mode. Can mount the projector at any pitch over a full 360 degrees. Video Display.With 1080p resolution and good color quality, the P502HL delivers bright, vibrant video for ambient light situations. Compact and light weight - under 20 lbs. Physical attributes. All the ports are on the back panel, with the internal USB A port behind a small cover on the upper left as viewed from the rear. The power connector is on the lower right. Lens shift controls sit on the top just behind the lens; intake vents are on the left side and the front panel; the right side panel includes the exhaust vents and controls, a security bar near the bottom, and a Kensington lock slot near the rear. Low Lamp Mode. The P502HL has two low lamp modes. Eco 1 drops brightness by about 17%. Eco 2 cuts it in half. In addition, there's a slider control in Eco Off mode with settings much lower than you need, ranging from 100 (full brightness) to 16, which we measured at a meager 194 lumens. Presentation Optimized Lumens. High Bright mode delivers more than 4900 lumens and reasonably good color quality for many presentations needs. If you include video or photos of people, however, skin tones can look a bit bluish-green, and you may or may not have a setting in the menus for adjusting hue, depending on your video source. If not--as with HDMI RGB input--Presentation mode gives slightly better color quality and about 3600 lumens. Video Optimized Lumens. A slight tweaking of the Gamma setting in Natural mode offers the best color for video and no change in the nearly 2650 lumen brightness. The hue was just a touch off, and the brightness might change somewhat if you adjust it, but the setting wasn't available with the HDMI RGB source we use for testing. Even without adjustment, however, colors were well within an acceptable range. Zoom Lens Effect. At it's full telephoto setting, the P502HL's brightness drops by 22% compared to the light output at the wide angle end. Brightness on our test sample dropped from 4919 to 3833 lumens in High Bright mode. Brightness Uniformity. The measured 83% uniformity is noticeable only with a solid white or light-colored image. Input Lag. The P502HL produces input lag of 66 to 68 ms depending on the preset mode. On-board Audio. The 20-watt mono speaker delivers acceptable sound quality for narration or movie dialogue and enough volume to for a mid-size to large room. Fan noise. The P502HL's fans have the quality of a low-level hum with a whooshing overlay. The rating is 39 dB in Eco Off mode and 33 dB in both Eco modes. However those are maximum noise levels. The fans vary their speeds depending on the internal temperature. At its loudest, the fan in full power mode is hard to ignore if you're sitting within about 15 feet in a quiet room. From the same distance in Eco mode I could still hear it if I listened for it, but it wasn't loud enough to be intrusive. Even at its loudest, this shouldn't be an issue for presentations in the sort of large room the P502HL is designed for, since you'll most likely mount it sufficiently far from seating. For altitudes starting at 5,500 feet and for 24/7 operation at lower altitudes, NEC recommends using High fan mode, which is loud enough to hear from more than 40 feet away. If you need to use it for presentations, you'll want to consider putting the projector behind a false wall to deaden the sound. Throw distance. The 1.7x lens offers a wide range of throw distances for a given size image. For a 120" diagonal at the native 16:9 aspect ratio, the range is roughly 11' to 18.5'. To find the throw range for the screen size you want, see the Projection Calculator. Lens Shift: At the bottom of the range for vertical lens shift, 33% of the image is above the centerline of the lens, and 67% is below the centerline. At the top of the lens shift range, the bottom edge of the image is 32% of the image height above the centerline. Depending on the vertical shift, the horizontal shift varied from a maximum of about 23% of the screen width left or right of the midline to a minimum of only 2%. If after taking advantage of the lens shift, you still have to tilt or swivel the projector, you can manually adjust for up to plus or minus 30 degrees of vertical keystone distortion and up to plus or minus 25 degrees of horizontal keystone distortion. The NEC P502HL's 1080p resolution, light weight, 20,000 hour light engine, and installation versatility combine to make it highly competitive for retail displays or signage and for presentations in rooms with a large screen or ambient light. At 4900 lumens, it is bright enough for a 200", 1.0 gain screen in moderate ambient light. In Presentation mode, light output is reduced to about 3600 lumens in exchange for somewhat better color for photos and video, and you still get enough firepower for a 170" image. Even using Eco 1 power level, for lower fan noise, Presentation mode offers 3000 lumens, which will fill a 155" screen in moderate ambient light. The 1.7x zoom and lens shift offer setup flexibility--whether for business presentations, retail displays, or signage--while the portrait mode and ability to mount the projector at any pitch add even more flexibility for creating displays in areas from floor to ceiling. Similarly, the 20,000 hour laser light source and phosphor wheel helps keep the total cost of ownership down for any application, which helps justify the $4599 price. It also makes the projector a particularly good fit for 24/7 use in retail displays and signage. And the HDBaseT connector simplifies setup, by letting you use a single Ethernet cable both for data and for control over a network. The solid video, finally, will let you add video to make a sign or retail display far more eye-catching, and it can come in handy for business presentations that include video or for showing, say, a full-length movie in a classroom.